Simona Halep of Romania returns the ball to Zheng Saisai of China during their women's singles match on the fourth day at the Wimbledon Tennis Championships in London. Romania's Simona Halep returns the ball to Germany's Angelique Kerber during their quarterfinal match of the French Open tennis tournament at the Roland Garros stadium, in Paris. 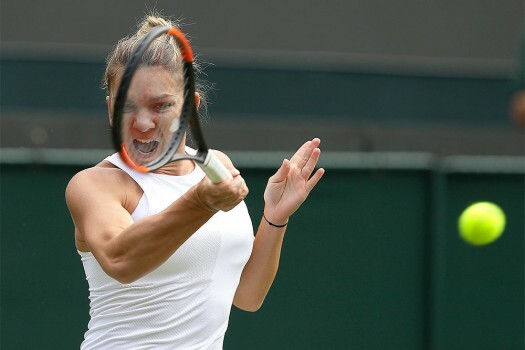 Halep held the number one ranking for 48 weeks, but after her loss to Serena Williams in round four, she said it wasn't her priority. Serena will no face seventh seed Pliskova of Czech Republic for a place in the last four. Fourteen-time Grand Slam winner and top seed Djokovic is gunning for a record seventh Australian title. Rafael Nadal dominated in typical fashion on clay, swaggering to an 11th Roland Garros title, but the injury-plagued Spaniard limped out of two other Grand Slams before further fitness problems curtailed his season. Spaniard Nadal has a comfortable lead in the ATP rankings ahead of second-placed Roger Federer and Novak Djokovic in third place.